← What separates a business from a company? She leaves behind a remarkable slate of success. Included on her coaching resume are 8 National Championships; 18 Final Four Appearances; 7 NCAA Coach of the Year and the Naismith Coach of the Century Awards; and the 2012 Presidential Medal of Freedom, the highest honor a United States civilian can receive. But those tell only a small fraction of Pat Summitt’s story. Her impact on the world of sports; on the lives of those who play, coach, and follow it; and on many, many others is unrivaled. Interviews with Bruce Pearl, who served as coach of Tennessee’s men’s basketball team from 2005 through the 2011 season, and Chamique Holdsclaw, who played for Coach Sumitt from 1995-1999, tell you all you need to know about the woman who has two streets named after her. Bruce Pearl told the story on ESPN’s Outside the Lines of the time he pulled his basketball team off of the court in the middle of practice. You see, the court at the University of Tennessee (Knoxville), “The Summitt”, is named after Coach Summitt and Pearl felt like his players were disgracing its namesake. That’s what she meant to Bruce Pearl, to the University, and to the game of basketball. Incidentally, she is also the only person with two Division I basketball courts named in her honor (“Pat Head Summitt Court” at the University of Tennessee at Martin, where she played, is the other one). Holdsclaw, one of 20 Kodak All-Americans coached by Summitt, tells of a different side of the woman she still considers a dear friend and mentor. As one of the greatest players in college basketball history–men’s or women’s–you would think her tenure at UT was a breeze. Anything but. Even amid a decorated career that included four All-America honors in four years (one of only six players to do so) and two Naismith Player of the Year Awards, she was more often than not the focal point of Coach Summitt’s ire. Yet Holdsclaw speaks of Summitt the way she would a mother, with the highest of esteem. Why? For the same reason one of the most successful (she won four state championships while playing at Christ The King Regional High School in Queens, New York) and heavily recruited (she played in the WBCA High School All-America game and every major college wanted her) high school players in history would knowingly and willingly accept a scholarship to play for one of the most intense coaches in the sport. For the same reason, despite the lofty expectations set by Holdsclaw, Tamika Catchings, Candace Parker, and Kara Lawson, among many more greats, all took the same path. 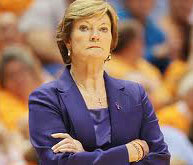 Pat Summitt demanded the best. Not the best that the fans or media expected. Not even the best that she, as head coach, expected. The best YOU should expect of YOURSELF. The best YOU had in YOURSELF. And through the roughest of times; this last season when she openly, honestly, and vigorously battled dementia, she showed us yet again what a leader is. She showed us what a winner is. But more importantly, she showed us what a fighter is. To be able to get the most out of yourself, indeed, requires strength and discipline. To get the most out of others requires courage. And to go down to the last minute taking her swings at life and its many obstacles, not only for herself, but for those who depended on her, says all you need to know about Pat Head Summitt. Head is her maiden name. Summitt is her married name. And if you ask me, they’re both perfect for a woman that was on the top of her game–and profession–for almost four decades. And tried to bring everyone around her along with her. Pat Head Summitt will be missed. But never forgotten. I wish her the best of health and happiness for the rest of her life.